Recently, I finally made true with one of my repeating New Year’s resolutions and catalogued all of my images. Until then, I had used an old version of ACDsee, which proved very inadequate due to its lack of advanced keyword query capabilities. Support for multiple catalogues, since I did not want to “stuff” everything into one catalogue. This immediately eliminated some programs such as Adobe Photoshop Album. Uploading of existing IPTC tags and EXIF data while cataloguing images. Almost all of the programs support this today. Queries against multiple keywords or EXIF / IPTC data. This is supported by all programs, but it’s not always easy or intuitive to do so in some of them, most notably iMatch. Easy offline viewing of catalogues (meaning the images themselves might be stored on removable media, but I wanted to be able to access them in a catalogue without having to insert the removable media). For some programs, such as ThumbsPlus, I could not figure it out, so I eliminated them as well. 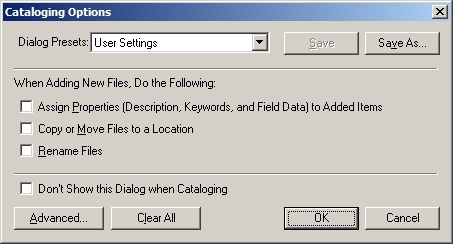 Backup and Portability of catalogues – I wanted to be able to easily back up the catalogues and then view them (or even migrate them over time, when a computer is replaced) on other computers. Working with Portfolio 7 is pretty straight forward. If you want to add images to an existing catalogue, you open it from within Portfolio 7 or double-click on the corresponding file in your file manager. Otherwise, you create a new catalogue in Portfolio 7. In most cases, it is sufficient to just click OK. 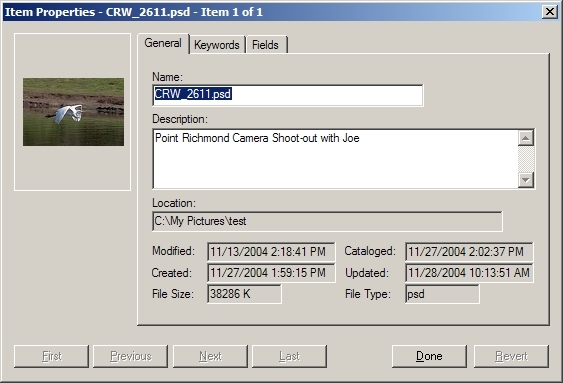 If you do so, Portfolio 7 uploads all the IPTC and EXIF data from the original images to the catalogue you selected. Alternatively, you can assign your own properties, in which case you override the existing keywords or descriptions. Personally, I never use the latter option – I usually tag my images during the download process (see also my review on Breeze System’s Downloader Pro), or you can use the File Browser in Photoshop CS to quickly add tags to all your images. Once the images are uploaded in Portfolio 7, you will see the usual thumbnails in the main window. 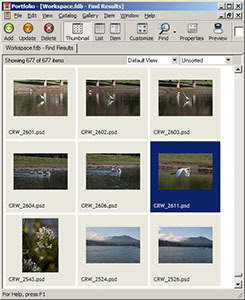 Double-clicking any of the images opens either the image in a separate window, or you can bring up the properties window where you can overwrite the existing information about this image in your catalogue. During my initial tests, I catalogued all kinds of file formats, including JPEGs, layered TIFFs, layered Photoshop files and Canon 300D RAW files. I experienced no problems with any of these. The only file format Portfolio 7 could not read was the new Adobe digital negative file format (DNG), but I would expect support for it in a future update (editor note: looks like this update is now available). When evaluating different cataloguing programs, the ability to query and find images in a very easy-to-use user interface was especially important to me. Portfolio 7 really shines when it comes to querying your existing catalogue to find a particular image or a set thereof. It can easily handle very complex queries, searching across all kinds of meta data, as exemplified in the screenshot below. Portfolio 7 has by far the easiest interface for advanced queries that I have seen so far. Easy backup: It should store the catalogue in identifiable files and in one folder, so it can be backed up. Surprisingly, a number of programs, including Adobe Photoshop Album, scatter catalogues across multiple folders, making it hard for the photographer to figure out which files need to be backed up. In contrast, Portfolio 7 stores a catalogue in one FDB file, and if you checked to create offline copies of your images, it stores these in a subfolder. In order to back up, just integrate the FDB file and the subfolder into your backup routine. 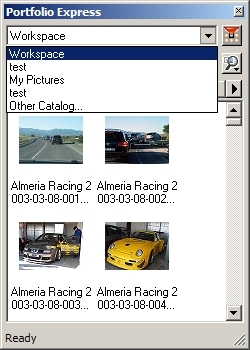 To help with not just portability, but to allow browsing of your catalogues on other computers and by other people, Portfolio 7 has a very cool browser program. The concept is very similar to Acrobat and the free Acrobat Reader – create it once, then distribute it and allow others to view it. Just burn your catalogue and the free browser on a CD and install them on a second computer, send them to your friends or to your publisher. They can install it anywhere they want and browse through your catalogue and do the same meta data queries that you can do on yours. Obviously, they cannot change the meta data or create their own catalogues, but that is not what you send them the browser for in the first place. Very cool! Best of all: It’s free! Another nifty function is Portfolio Express: It resides in the system tray and gives me very quick access to all my catalogues. After picking the catalogue I want to search, I can search using keywords and then open the results in Portfolio itself. Once I discovered this feature, it quickly became my preferred way to search my catalogues! It should also be noted that Portfolio 7 offers much more functionality that I do not require for my workflow, but that might be useful for other users. Among it are capabilities such as FolderSync (add new images to an existing folder and they will automatically be catalogued – I do not use it, though, I always copy new images to a new folder), create web sites, slide shows and Quicktime movies from catalogues, burn CDs or DVDs, batch convert photos and all of the basic file management capabilities such as renaming, copying or deleting your images. For administrative purposes, you can also set access levels and passwords to your catalogues. I already have established workflows for these capabilities, so I do not require them. However, you might want to at least evaluate these, in case they provide a potential improvement to your workflow. Extensis Portfolio 7 is a very capable program for cataloguing your images and subsequently finding them again, even if the media where they are stored is offline. The free add-on browser program is a very cool feature that in itself might be worth the cost of the software. At $199, it’s not inexpensive, but the ease of use to build and search catalogues, the browser add on and the portability of all catalogues make it definitely worth the money. I can highly recommend it.